Planting bulbs in the fall can take little time and effort and in Spring you can enjoy even more blooms. When the overnight temperatures start dropping and the ground starts to cool is when your bulbs should go into the ground. Around 50° overnights. If you buy your bulbs before this time, which it fine, store them around 60 to 65 degrees F. in a dry area. Bloom Time – Read the labels of bulbs to see when they are expected to bloom and you can plant for a succession of blooms through the Spring into Summer. Check out the Farmers’ Almanac graph of when fall planting bulbs are expected to bloom as well as soil type, sun requirements, depth of planting, and locations they are good for. Bloom Colors – You could want a certain color repeated throughout your yard with one color like white, purple, pink. Or if you want to dive into color combinations you can go back to what we learned in art class and use color schemes! Analogous, complementary, monochromatic, and split complementary colors are color schemes that you can build with flowers and other plants! Allium – purple pom poms atop wand-like stems. Crocus – very early color. Some even bloom in snow! Daffodil (Narcissus) – sunny yellows and white. These are great in groups. Great for forcing. 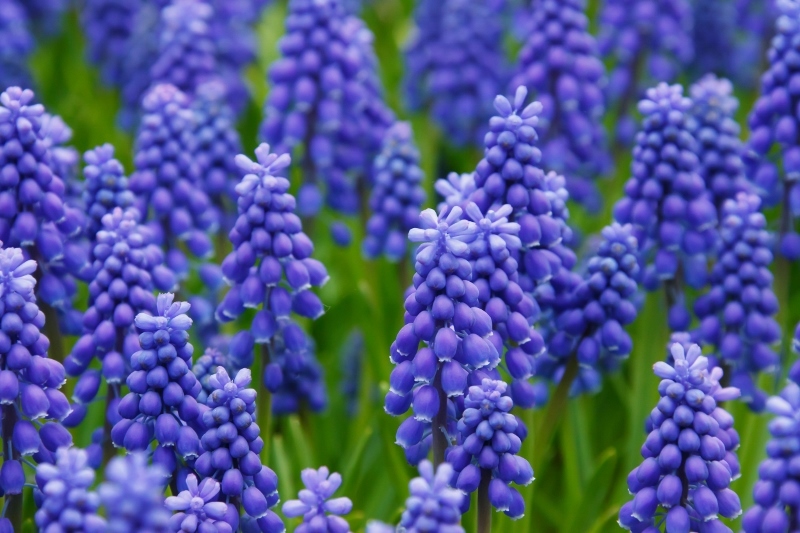 Grape Hyacinth (Muscari) – purple or pink. Hyacinth – fragrance that will stop you in your tracks! White, pink, purple. Great for forcing. Tulip – Huge variety of colors, sizes and bloom times. Have a ball! Great for forcing.